I have hundreds of draft DIY posts sitting between my emails and on my blogger account not really having the time to finish them and publish them. So here it goes - a really simple DIY project to create extra wall storage in your house. So I thought I would start my first blog post with one of the first DIY projects I did when we moved into our new cottage. 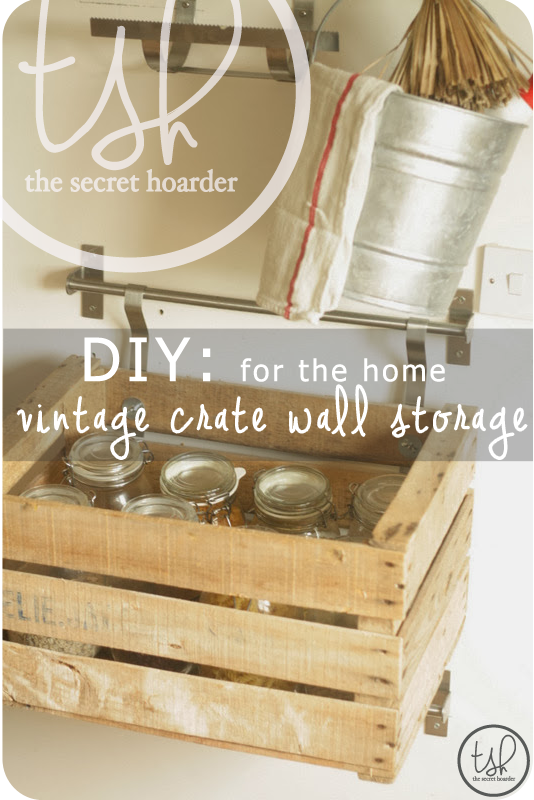 The vintage crate wall storage - I am particularly proud of this project as its still standing 18 months later and we use it every day! (not like some of the shelves or curtain rails that i have put up and have ripped the entire wall apart) I blame it on the wall – it has nothing to do with my wall drilling skills. This makes a great pantry basket, recycling bin but can also be used in the bedroom for clothes, in the hallway for hats, shoes and bags, washing baskets in the laundry, or filing in the office. 3 x 59cm Grundtal rails from Ikea.You can choose the length depending on how much wall space you have. They come in 40cm, 59cm and 80cm. You need to be careful with the 80cm as they are slightly longer they could buckle with the amount of weight you have on there. 2 x Grundtal Wall Container from Ikea. or any 2 of their Grundtal wall range that offer two long support hooks that you can screw onto the crates. 1 x Kitchen roll holder Grundtal range. Or you could also just buy the Grundtal S Hooks and hang your utensils or tea towels. 4 x Screw bolt and matching washers.. see picture and head down to your local building store to see what they have available in the size you need. You will need to check it against the hole already made in the hooks of the Wall Container. 2x Vintage Apple Crates – I live in Somerset so these are widely available round these ol parts but don’t pay more than £30 per crate! I paid £10 for mine and you can pick them up much cheaper at Flea Markets rather than in interiors boutiques around East London. To do this even cheaper you could just drill the crates into the wall. The beauty about having them on the hooks is that you can take them in and out with ease whether it be out to the rubbish bins or even in the garden to pick some fresh fruit and veg! 1. Drill the rails into the wall. You want to start by first marking out where you are going to drill on the wall. You also want to consider the spaces between the 3 rails and to allow enough room for you to lift the crates in and out. I have roughly 55- 60cm between the rails and this is based on me having a standard size crate (30 x 55 x 35 cm). TIP: Get your rail up by not drilling it completely tight – drill all the screws into a point where its firm but still has give – that way you can get into better position with the spirit level and finish it off by screwing the screws nice and tight at the end. You will see from my picture that i have quite a few holes in the wall – this was a pretty frustrating job for me as I obviously hit the lintel in the wall and didnt have a diamond drill bit nor a hammer drill! 2. Now you want to drill holes in the crates. I drilled these about 6 cm from the edge of the crate – i felt that if my hooks were spaced out a little they would offer better support. Use a slower setting on your drill, turn hammer off and use a wood drill bit – some crates can be fragile and you dont want to split the wood. 3. Slot your bolts into the hole with the wall hooks and place a washer and screw on the inside. it could be a good idea if you were using it as a recycling bin to have 3 crates – and stencil spraypaint on each crate – Paper, Plastic, Glass. Would love to know whether you have tried this yourselves and how it turned out and what you used it for! Hopefully no wall drilling mishaps like mine!